The Elephant Sanctuary is a non-profit that provides a home and individualized care for aging elephants, most of which are retired from zoos or circuses. The organization does a lot of community outreach and wildlife conservation education, raising public awareness of the complex needs of elephants in captivity, and the crisis facing elephants in the wild. 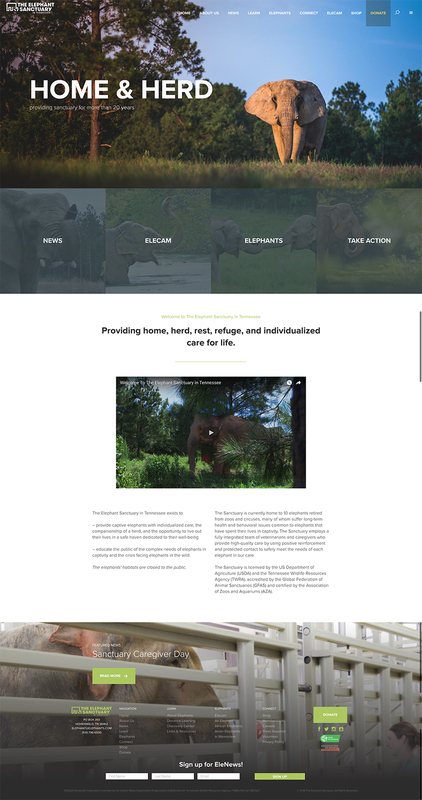 When we met Elephant Sanctuary, one of their biggest challenges was an outdated website that was time-consuming and cumbersome to update, and provided limited control to the staff. From a marketing perspective, they had a strong need for a brand refresh. As a non-profit surviving on donations, they needed to engage their existing donors and cultivate a younger audience to grow and maintain the sanctuary. Our goal was to provide fresh, modern branding, and a new website that allowed for easy and frequent content updates to engage followers of the organization. 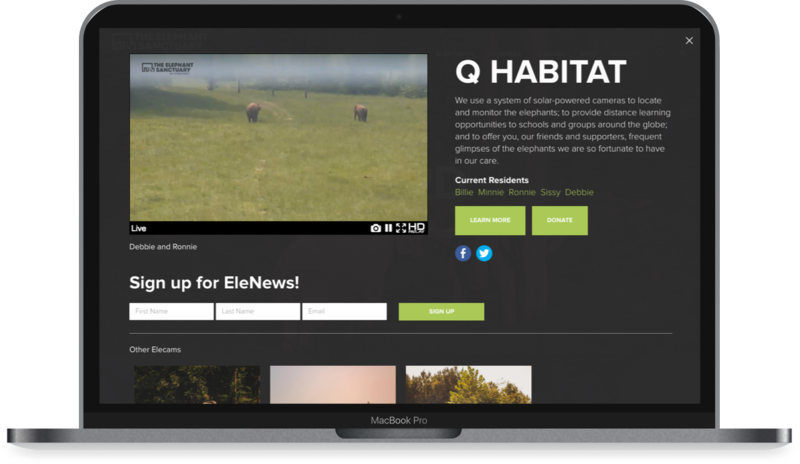 We also sought to give them comprehensive control over their most engaging feature of all: the EleCam, a real-time video stream of the elephants living in their natural habitat. Our design approach leverages fantastic photography provided by the sanctuary and clean, bold typography to tell the story of the elephants and their life in Tennessee. With a wealth of content to display and a variety of user types visiting the website, we worked with the Sanctuary to carefully organize the sitemap into meaningful channels of content. The site is now easily navigable by anyone from families to educators to avid EleCam viewers. Dozen has done a great job of understanding our organization and helping us find solutions to our unique challenges and opportunities. Given the amount of custom functionality required for the site, we built it on our own proprietary CMS using the PHP Laravel framework for ease of scalability and custom feature development. The Laravel framework is a mature platform that lends itself to rapid development of reliable applications. It particularly fit the needs of this client given their financial constraints, and allowed us to integrate with HD Relay, a live streaming service that powers the EleCam. Through the site, they've been able to more actively promote fundraising campaigns and have had a lot of success in their fundraising efforts. We were able to give the client, particularly the non-technical folks, an easy-to-use and easy-to-understand interface for actively managing the content on the site. This was revolutionary for the Sanctuary, and as a result of that, they were able to hire a content manager to actively promote the Sanctuary through the site in near real-time. The organization saw incredible positive feedback from the Sanctuary's dedicated followers on social media and marketing channels.